This is a classic story of universal design. One in which EGGS has pulled out all the stops to help create a product range that is not only visually stunning, but also caters for the extremes of all user groups. 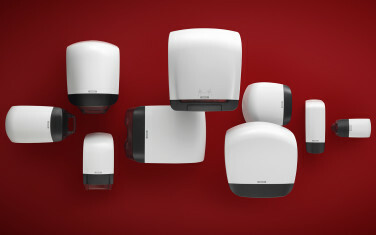 An elite range of hygiene dispensers that has transcended Metsä Tissue’s original business model and catapulted the company into a league of its own. Together with EGGS Design, Metsä Tissue is the recipient of the Award for Design Excellence 2016 and the Design for All Award 2016, presented by The Norwegian Centre for Design and Architecture (DOGA). In April 2016, Katrin Inclusive also won the UK's Tomorrow's Cleaning Award 2016. This 33 second long film is in Norwegian. The jury leader and the specialist for inclusive design explain why Katrin Inclusive is nominated for the prestigous Design for All Award 2016 from DOGA. All public buildings in the Nordic region and many throughout the EU are now legally required to choose products that follow the guidelines of universal design. Therefore, the major paper and soap manufacturer Metsä Tissue wished to create a new product range that would enable their customers to fulfil these requirements. An unrivalled series of dispensers to place the company in pole position as market leader in universal design for hygiene products. 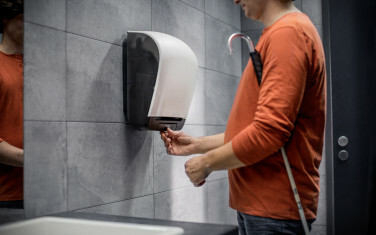 All public buildings in the Nordic region and many throughout the EU are now legally required to choose products that follow the guidelines of universal design. During the concept development stage, EGGS invited a variety of user groups to rigorously test out various dispenser prototypes. These included kids, people who are blind, some with arthritis, those who are visually impaired and wheelchair users. We also invited facility managers and cleaning personnel, workers who regularly rely on these products to get their jobs done efficiently. They inspired fresh avenues of thought, which led to even better solutions. Through repeated trial and error, we found that each user group challenged the product in different ways. For example, on the paper towel dispenser we incorporated a solution where the paper comes out of the front, instead of from underneath. We also created a bold contrasting area around this section with a large push-bar containing braille, to make it more user-friendly than the traditional feeder wheel located on the side of most other dispensers. These are just some of the solutions we applied to one dispenser model. Every detail throughout the entire Katrin Inclusive range has been meticulously thought through, because by making a product that’s better for people who challenge it, you automatically make it better for everyone. Katrin Inclusive consists of a total of 9 different dispensers for paper, soap or disinfectant. 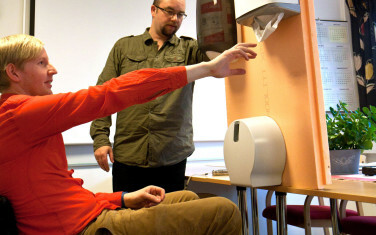 For Metsä Tissue, universal design makes perfect business sense. As a business tool, it has been the kicker for attracting an ever-increasing number of new customer contracts. Overwhelming support from distributers, facilities management and public institutions has allowed the company to feel ultra-confident about wiping away any potential competition. Even the pope is known to use Katrin dispensers, in one of the high-end hotels he often stays at. High praise indeed. When cleaning public restrooms, facility personnel need to instantly spot if a dispenser needs refilling, so we made the side walls transparent.